Aug. 25, 2000John F. Kennedy Space CenterVol. 39, No. 17Spaceport NewsA Day in the Life of KSCDiary of July 26, 2000. The mood is high at Kennedy Space Center. Zvezda docked successfully with the International Space Station last night. With that crucial component firmly in place, the Space Shuttle Program is poised to ramp up. 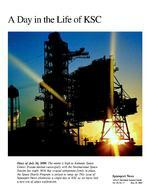 This issue of Spaceport News chronicles a single day at KSC as we move into a new era of space exploration. SPACEPORT NEWS Aug. 25, 2000 Page 2 Preparing the pad Workers maintain Pad A at Kennedy Space Centers Launch Complex 39. Above, Jack Hanover of SDB Engineers and Constructors Inc. prepares to change a bearing in the Rotating Service Structure. At top left, Robert Lust of IVEY Construction pauses on his way to install a safety hand rail. At top right, a team of United Space Alliance workers don gas masks before calibrating the pads hypergolic fuel system. SPACEPORT NEWSPage 3 Aug. 25, 2000Coming in for landing Clockwise from above: A Super Guppy transport aircraft lands at the Shuttle Landing Facility carrying the P1 truss for the International Space Station. Inside the control building, air traffic controller Donny Linton, left, and SGS air facility manager Bob Bryen survey the SLF runway. Astronaut David Brown speaks with aircraft servicer Bob Dryer after having landed the T-38 aircraft at the SLF. Dryer and aircraft servicer Chuck Floyd check the aircraft Brown has just flown in from Johnson Space Center. Page 4SPACEPORT NEWSAug. 25, 2000 Meeting of minds Center Director Roy Bridges Jr. meets with his senior staff members at KSC Headquarters. At top left, Tip Talone, NASA director of International Space Station and Payload Processing at KSC, gets ready for the meeting. At top right, Bridges talks to his senio r staff. Seated at his left are Marv Jones, associate director, and JoAnn Morgan, director of External Relations and Business Development. Page 5 SPACEPORT NEWS Aug. 25, 2000 Getting down to business United Space Alliance data analyst Daniel Murphy helps test new Checkout and Launch Control System software in the Hazardous Materials Facility. Jason Cobb, a biology student from Morehouse College in Atlanta, performs a Life Science analysis. Sue Gross, NASA executive secretary in Shuttle Processing, listens to a coworkers question. David Caldwell, chief test conductor for United Space Alliance, monitors a flight control system test from the Launch Control Center. United Space Alliance pad leader John Reinholt answers a call in the Vehicle Assembly Building. Reinholt coordinates work in the VAB. Photobition clerk Lynn Donovan files negatives. Page 6SPACEPORT NEWS Aug. 25, 2000Fortifying ourselves Above, cook Wayne Younger takes a breakfast order in the Multi-Function Facility. At top left, InDyne bindery technician Patty White, left, and copier operator Sue McNeely take a break from their work in Reproduction at KSC Headquarters. At top right, High Voltage Shop lineman William Lorton lifts weights in the KSC Fitness Center in the Operations & Checkout Building. Aug. 25, 2000SPACEPORT NEWS Page 7Fostering teamwork Team spirit is created both formally and informally at KSC. Above, secretary Sandy McCandless kids with her boss, Shuttle Test Director Douglas Lyons. At right, Change Leaders Network members Shannon Roberts and Lana Maier discuss the KSC 2000 initiative and helping employees benefit from changes made. Student Sarah Stout cuts up with, from left, flight crew support specialist Lauren Lunde, astronaut David Brown, attendant Glenda Jackson and flight crew support specialist Delores Abraham. Page 8SPACEPORT NEWS Aug. 25, 2000Building and maintaining CMT structural painters Chuck Ham, left, and Rick Koury touch up pipes at the Space Station Processing Facility. Mil-Con workers install fiber optic cable for the new multip Spacecoast General Contractors workers change out a cable on a weather tower. From left are laborer Alan Hensley, foreman Dan Fowler and laborer William Davis. A VA Paving operator helps with grading a section of Sharkey Road. Aug. 25, 2000SPACEPORT NEWS Page 9 p urpose hangar at the Shuttle Landing Facility. The hangar is part of the planned Reusable Launch Vehicle Support Complex. Firefighters with the NASA/USAF Fire Department test and maintain fire truck equipment. Page 10SPACEPORT NEWS Aug. 25, 2000Making it here NASA mechanical engineering technician Jim Niehoff uses a waterjet to rough cut metal in the Development Integration Laboratory, which is known on Center as the Prototype Shop. NASA mechanical engineering technician Rusty McAmis uses a milling machine. Debbie Mitchell, a United Space Alliance technician in the tile shop of the Thermal Protection System Facility, creates a gap filer for the Orbiters Thermal Protection System. United Space Alliance machinist Kreil Marshall shows a tile manufactured for thermal protection of the X-38 future vehicle. The tile is composed of the same materials as tiles made to protect the Shuttle. Aug. 25, 2000SPACEPORT NEWS Page 11Providing support Support services come in a variety of forms at Kennedy Space Center. Counterclockwise from above: SGS custodian Tracy White dumps white paper into a recycling bin. SGS Officer Richard Stein checks an employees badge at Launch Pad A. InDyne senior distribution clerk Bill White, left, and mail courier Gary Swensk sort mail. Randall Crosby helps a customer at his Blind Mans snackbar. Ikons Don Dickenson makes copies of legal documents for KSCs Chief Counsel Office. Page 12SPACEPORT NEWS Aug. 25, 2000Processing Station Workers contribute to processing International Space Station elements in the Space Station Processing Facility and the Operations & Checkout Building. Clockwise from above: Boeing technician Klevenger Willliams checks Station paperwork. Boeing technician Connie Adams prepares hardware tags. Boeing engineers Eric Obleman, Dan Fiers and Marty Hall test fiber optics for the S0 truss. Technicians Tony Burris and Don Vosgien check the alignment on a test stand. Aug. 25, 2000SPACEPORT NEWS Page 13Preparing the Shuttle In Orbiter Processing Facility 3, R.C. Koontz, United Space Alliance manager of the forward and aft, at right, checks in with U SA pad leader Arthur Bubba Howard on the progress being made processing Atlantis for the STS-106 mission. United Space Alliance orbiter technician Tony Dees works on the main landing gear. Thermal Protection System specialist Mickey OBrien installs thermal protection around the orbiters window. Ed Bear Rieck, aft technical lead for United Space Alliance, checks a hydraulic pump reading for Atlantis. Page 14SPACEPORT NEWS Aug. 25, 2000Recording the story Jim Halsell, KSCs new manager of Space Shuttle Program Launch Integration, is photographed by Jerry Cannon of Johnson Controls Junichi Ono of Kobi, Japan, interviews astronaut Rick Searfoss at the NASA News Center for a childrens show to air on Japanese public television. Nancie Strott, a multimedia specialist for Dynacs, edits video in the KSC Digital Media Lab. Aug. 25, 2000SPACEPORT NEWS Page 15Ending the day Atlantis Flow Director Kelvin Manning locks his office in the Launch Control Center and heads out to the parking lot. KSC workers take the scenic drive home south down Kennedy Parkway. The Vehicle Assembly Building provides the Centers signatur e backdrop. John F. Kennedy Space Center Managing editor. . . . . . . . . . . . . . . . . Bruce Buckingham Editor. . . . . . . . . . . . . . . . . . . . . . . . . . Kathy Hagood Editorial support provided by InDyne Inc. Writers Group. NASA at KSC is located on the Internet at http://www.ksc.nasa.govUSGPO: 533-128/00039Spaceport News Spaceport News is an official publication of the Kennedy Space Center and is published on alternate Fridays by the Public Affairs Office in the interest of KSC civil service and contractor employees. Contributions are welcome and should be submitted two weeks before publication to the Media Services Branch, XAE-1. E-mail submissions can be sent to Katharine.Hagood-1@ksc.nasa.gov Aug. 25, 2000SPACEPORT NEWS Page 16Looking WestIn putting together this special color edition of Spaceport News it was our desire to portray a single day in the life of KSC, focusing on our diverse workforce and the critical roles we play in the nations space program. On July 26, photographer George Shelton, snapped more than 700 frames during a 12-hour period at KSC. Spaceport News Editor Kathy Hagood, working alongside Shelton, spoke with hundreds of employees on the job. To access these photos and some of the other photographs we didnt have room to print, go to: http://wwwpao.ksc.nasa.gov/kscpao/snews/photos/workersatksc/  Bruce Buckingham, managing editor Kennedy Space Center is NASA  s lead center for Expendable Launch Vehicle Launch Services. NASA ELVs are processed and launched not only from the Cape Canaveral Spaceport, but also from Vandenberg Air Force Base in California and additional locations. These photographs coordinated from KSC  s resident office at Vandenberg show processing of a National Oceanic and Atmospheric Administration satellite set to be launched at Vandenberg no earlier than Sept. 14.